Ryan's exit is potentially the final chapter in a once-promising political career that many inside the GOP long thought would one day make him president. NPR congressional correspondent Susan Davis has this report on Ryan's parting legacy in the Trump era. 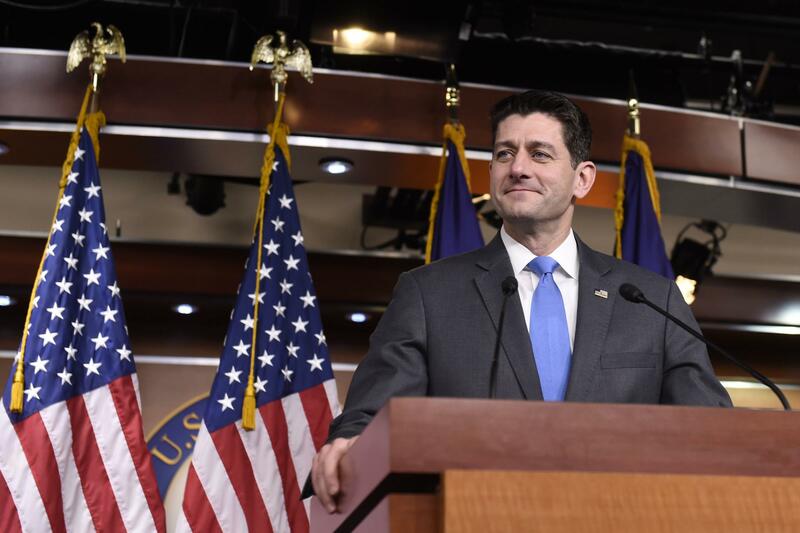 SUSAN DAVIS, BYLINE: In response to Speaker Ryan's retirement, his longtime friend Vice President Mike Pence tweeted that few Americans have done more to advance the Conservative agenda over the last 20 years. Paul Ryan would agree with that. Here he is on C-SPAN in 1998. PAUL RYAN: So my question is not whether the welfare state's going to fail, because ideologically and morally, it will. What are we going to replace it with? That's what I'm concerned about, and that's why you have to have a set of core principles that guide you as you replace these things. DAVIS: Over those 20 years, Ryan became the GOP's go-to policy guy on the federal budget. He made many of his core set of principles the mainstream view of the party. Along with fellow House Republicans Eric Cantor and Kevin McCarthy, the trio gave themselves a nickname and made a media splash with a 2010 book by the same name. UNIDENTIFIED PERSON: Together, they are the Young Guns - innovative, energetic, forging new solutions. One book will outline a vision to restore America's prosperity. DAVIS: When the GOP won control of the House that year, Cantor and McCarthy became party leaders. Ryan took control of the House Budget Committee. He convinced Republicans to pass his ambitious fiscal blueprint to balance the budget, tackle the debt and to help pay for it all by privatizing Medicare. RYAN: This is our defining moment. We must choose this path to prosperity. DAVIS: He succeeded in almost single-handedly making the privatization of Medicare a philosophical pillar of the Republican Party. To fiscal conservatives, that moment made Ryan a hero. To Democrats like Nancy Pelosi, a villain. NANCY PELOSI: I want to say to my Republican colleagues, do you realize that your leadership is asking you to cast a vote today to abolish Medicare as we know it? DAVIS: It also fueled his national rise, which peaked in 2012 when Mitt Romney tapped Ryan as his running mate, saying this. MITT ROMNEY: With energy and vision, Paul Ryan has become an intellectual leader of the Republican Party. DAVIS: Ryan was certain they were going to win, so he returned to Capitol Hill dejected. He found renewed energy in 2015 when he became chairman of the powerful Ways and Means Committee and set his sights on a lifelong goal of rewriting the federal tax code. But House Speaker John Boehner threw an unwelcome wrench into Ryan's plans with his surprise resignation that same year. After weeks of internal drama, it became clear that only one Republican could bridge the ideological divides within the party and secure the votes to become speaker. He didn't want the job, but he agreed to do it. RYAN: We're going to move forward. We are going to unify. DAVIS: But the reluctant speaker quickly became swept up in another political battle he didn't seek out. As the 2016 presidential campaign unfolded, Ryan and Donald Trump came to personify the ideological wings at war within the GOP. And for much of 2016, the Ryan wing believed they would win out. The speaker positioned himself and his views as the counterweight to Trumpism. He disavowed their candidate when he showed sympathy to white nationalist sentiments. RYAN: When I see something that runs counter to who we are as a party and as a country, I will speak up. DAVIS: And when Trump attacked a federal judge by implying he couldn't be impartial on immigration because he was Hispanic. RYAN: Claiming a person can't do the job because of their race is sort of like the textbook definition of a racist comment. DAVIS: And he disavowed Trump in the homestretch of the campaign after the "Access Hollywood" tapes emerged. RYAN: I am not going to defend Donald Trump - not now, not in the future. DAVIS: The Trump wing won, and Ryan quickly realigned himself as a presidential loyalist. He declined to criticize Trump to the point that he cracked a knowing joke about it at a charity dinner last October. RYAN: Every morning, I wake up in my office and I scroll Twitter to see which tweets that I will have to pretend that I did not see later on. DAVIS: Ryan made the same bargain that most Republicans have made under Trump - to tolerate his tweets and character failings in the pursuit of shared policy goals. And for Ryan, it was worth it. In announcing his retirement today, he said the $1.5 trillion tax cut passed last December is one of his greatest achievements, and he owed it all to President Trump. RYAN: The fact that he gave us this ability to get all this stuff done makes me proud of the accomplishments that I've been a contributor to - makes me satisfied that I've made a big difference, and he's given us that chance, so I'm grateful to him for that. And that's really - that's really how I see it. DAVIS: The nonpartisan Congressional Budget Office this week delivered a reality check on Ryan's core set of principles. The deficit and debt are rising faster now, in part due to those tax cuts. By the end of the next decade, the public debt is projected to hover around $29 trillion. CHARLIE DENT: And I've said this many times, that, you know, the litmus test for being Republican these days is not about any given set of ideals or principles. It's about loyalty to the man. DAVIS: In the end, Paul Ryan has his principles, and Donald Trump has his Republican Party. Susan Davis, NPR News, Washington. Transcript provided by NPR, Copyright NPR.